You may have never heard of economist and wealth manager Harry Dent but many students of the economy have. Harry Dent wrote, The Great Boom Ahead, which predicted the financial bull market of the 1990’s. He also predicted that the 2000s would see the Dow Jones Industrial Average soar to 40,000 but later revised that down in 2006. His predictions are often extreme but for those who believe that history repeats itself, it would be irresponsible to dismiss his predictions as the words of a dooms day profit. He believes that it won’t be long before the world economies will have a financial meltdown not seen since the Great Depression. What do you need to know about the details of his forecasts and how dire are they? If he’s right, what should you do to protect yourself against this complete meltdown of the world monetary system? Don’t say we didn’t warn you. Harry Dent has taken his share of criticism. Although there are a lot of people who make dire predictions in order to get a little face time with the financial media, Dent has years of research to support his claims. Not all of his predictions have panned out but the research behind those predictions is studied by best of the world’s economists. One of his best known theories has to do with long term spending habits. He believes that once a person has kids their spending picks up and once their children graduate from college spending turns to paying down debt and saving for retirement. According to Dent, spending peaks at an average age of 50 years old. He believes that the baby boomer generation had an average peak of spending in 2009 which represents that top of the stock market for the foreseeable future. To sum up his ideas, the only reason we haven’t seen a complete economic meltdown is because the United States Federal Reserve continues to print money and artificially stimulate the economy but the banking crisis has left so many consumers and businesses drowning in debt that there is no amount of stimulus that can allow the economy to recover. The only way to recover, according to Dent, is to allow it to correct without the help of artificial stimulus. Another one of Harry Dent’s theories is that when a bubble bursts, it returns to its pre-bubble level. This, according to him would put the Dow Jones Industrial Average at 3,600 to 5,000. He also sees gold correcting to a price of $400 to $500 per troy ounce and home prices falling significantly more. Florida, Dent’s state of residence may see home prices fall as much as 30% to 35% before the bottom emerges. Finally, he believes that unemployment could rise to as much as 15%. If his predictions are true, this would represent a crisis not seen since the Great Depression. He believes that all of this could begin as early as 2012. If he’s right, first he suggests selling your home and renting until the crisis comes and goes. He also believes that now isn’t the time to believe that the markets will recover if you need money for retirement. Once the crash starts, demand that your financial adviser pull your money out of the market and in to ultra-safe investments. 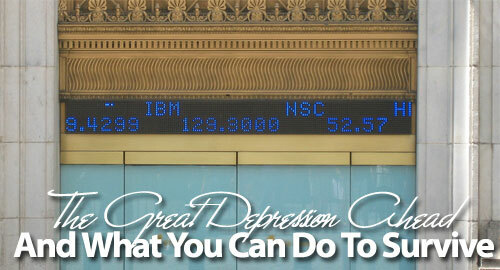 Once the markets bottom out, it may represent the buying opportunity of your life. His critics are quick to point out that Harry Dent has made his fair share of incorrect predictions. He may be too severe in his forecast but it’s hard to argue that with the amount of debt held by governments and even more important, individual households presents a problem. Unless the government can find a way to get household debt to a manageable level nationwide, there is very little that can be done to prevent a meltdown. Most economists agree that further stimulus of the financial markets may be detrimental to the markets. Do you believe Mr. Dent? If you do, you’re not alone. Let’s hope that he’s wrong. A while back when President Obama and congress passed the health care reform law, there was widespread criticism from some small business groups and lobbies because of some stringent new 1099 tax reporting requirements that was a part of the law. Basically that portion of the new law aimed to increase government revenue by having small business and freelancers (like myself) report more transactions to the government via 1099 reporting. In the past small businesses and freelancers would have to report to the government any time they purchased $600 worth of services from an outside vendor. The new requirement, that was to go into effect in 2012, would also make it a requirement that small businesses and freelancers file a 1099 for every company that they purchase $600 worth of goods from as well. While that may not sound like a huge deal, many recognized that the costs to comply with this order for many small businesses would be a job killer, and in some cases, a business killer. At the very least it would mean a lot of time and money wasted by businesses reporting on what could potentially be hundreds of transactions that could possibly put any vendor over the $600 threshold. Because it was agreed that this part of the new law wasn't a good thing, Congress and the President worked to come up with a repeal of the 1099 reporting requirement. Before the election last fall the talk of how to repeal the 1099 reporting requirement of the health care law started. While it didn't get passed last year before the election, this month the Senate and House were able to come to a solution. They passed a measure that would repeal the 1099 reporting requirement, and relieve small business from at least one more pressure they don't need in this tough environment. President Barack Obama signed a bill repealing a tax-compliance mandate in last year’s health- care law, giving a victory to business groups that led a campaign against the requirement. The repealed provision, under which companies would have had to report more transactions to the Internal Revenue Service, was included in the law as a revenue-raising measure. It was to have taken effect in 2012. “Small business owners are the engine of our economy and because Democrats and Republicans worked together, we can ensure they spend their time and resources creating jobs and growing their business, not filling out more paperwork,” Obama said today in a statement released by the White House. To cover the cost of the forgone revenue from the repeal, the legislation Obama signed today includes provisions that will curtail health-insurance tax credits in the health-care law. How Will They Pay For The Decrease In Revenue? The new 1099 reporting requirement was expected to increase revenue by 21.9 billion dollars, which would help pay for the new health care law. The new law changes the portion of the health-care law that deals with the health insurance tax credits that low- and middle-income Americans will get. Eligibility for the tax credits, which are paid directly to health insurers, is determined each year by examining income from a prior year. At the end of each year, there is a reconciliation through which the government can seek repayment of credits from people whose incomes rose. The new law changes the calculation and will require more people to return overpayments. Democrats maintained that this portion of the legislation represented a tax increase for people who happened to receive a year-end bonus. So the government has realized that certain provisions of this law might put an undue strain on small business, and have now repealed those measures. Now if only they would see just how much of a strain the rest of the law will put on our health care system in general – and repeal that as well! (</end rant>). What do you think of the 1099 reporting requirement repeal? Are you happy about it like I am? Do you think that they should have left it in place? Give us your thoughts in the comments! Government Considers New Rebates For Electric Vehicles: Cash For Clunkers Part Two? A while back the Obama administration put out a rebate program for new car buyers called Cash For Clunkers where the new car buyers could get between a $3500-4500 rebate on the purchase of a more fuel efficient new car, in exchange for trading in their old less fuel efficient vehicle. The program had the goal of trying to get old gas guzzling clunkers off the road, while at the same time getting people to buy more fuel efficient vehicles. The program, while it was a nice idea, was limited in scope as one analysis estimated that less than 5% of vehicles still on the road at the time were even eligible to be turned in, in exchange for the rebate. Add to that the fact that the program didn't really lead to an appreciable gain in new car sales as was hoped, just taking future sales and moving people's timelines up in most cases. The program was also fraught with government paperwork problems, and a lot of car dealers reported problems in claiming the rebates. Now, we may have another green vehicles rebate coming down the pipe if the Obama administration gets it's way. If you look at President Obama's budget, a current $7500 tax credit that can be claimed on purchases of energy efficient vehicles would be changed to be a direct rebate that would be available at the point of sale. Ready for another cash for clunkers program? It looks like General Motors is attempting to replace it's own consumer incentives with tax payer money. The car company, bailed out of bankruptcy in 2009 by the American tax payer, appears to be turning the government into an automatic rebate provider. The Obama administration and their friends on Capitol Hill are floating around a proposal to change the $7500 tax credit for green vehicles. This change can be found not only in President Barack Obama's budget but also a bill proposed by Senator Debbie Stabenow, Michigan Democrat. In an appearance at a battery assembly plant in Indiana, vice-president Biden also talked about the change that they're hoping to make and how they believe it would be good for companies making products for green vehicles. Last month, the White House endorsed making the $7,500 tax credit for electric vehicles available at the time of purchase. “You won't have to wait,” Vice President Joe Biden said at an a Indiana battery assembly plant, adding it would be like the cash-for-clunkers program. Since the change has made it into the president's budget, and Senator Stabenow of Michigan has introduced a bill (“Charging America Forward Act” (S.298)) , it does seem like the administration is interested in seeing this through. So how exactly would the rebate work? It would essentially be a $7500 coupon that consumers could use in buying an electric vehicle at the dealership. Essentially, if one were to buy a $41,000 Chevy Volt, the buyer gets a $7,500 coupon, so the final price is $33,500. In the end, the auto dealer assumes the risk of the government giving them this tax credit. There aren't a lot of purely electric vehicles on the market currently, but among the vehicles eligible for the rebate are the Chevrolet Volt, and the Nissan Leaf. So how long would the rebate be available? Representative Sander Levin of Michigan, the top Democrat on the House Ways and Means Committee, said last month he backed legislation to enable automakers to claim the tax credits on 500,000 electric vehicles. The current cap is 200,000. So at the 500,000 electric vehicles cap, that would be around $3.75 billion dollars. Who Does The Rebate Benefit? To me one thing that is a bit funny about this rebate is how the company it most affects, GM, is one of the few companies that the government actually has a big interest in via the “too big to fail” bailouts of a few years back. So in essence the government owns a big interest in one car company and is now making legislation that mainly helps that company. Interesting. GM, with about 24 percent of the electric-vehicle market, and Nissan will be the winners, because they’re already selling the cars, said Michael Omotoso, director of powertrain forecasting at J.D. Power. Honda Motor Co., which is at least a few years away from selling an electric model, will be among the losers, he said. Other carmakers have expressed some displeasure with the idea of the rebate as it will give an unfair competitive advantage to GM and Nissan, the companies with an electric car on the market already. Others, like Ford, are rushing to get their electric vehicles on the market for end of 2011 or early 2012. In the end the those who were considering buying electric vehicles previously will most likely be jumping on this rebate once it becomes available- if it becomes available. For many others even with the rebate electric vehicles are still pretty costly, and even a rebate of this size may not be enough to convince them to move over. What do you think? Will this rebate become law, and what effect will it have on the sales of electric vehicles? Would it be enough to convince you to move to electric, or do electric cars have more hurdles to clear before you'll consider them? In 2008, when the government announced plans to bail out the auto industry, many Americans were surprised to learn that the industry has reached such a low point. At the time the big American auto companies were all ailing from economic woes, and faced all out bankruptcy. The reasons? Non-unionized competition from overseas, huge pension costs, and the inability to fund jobs and benefits. Thanks in no small part to the economic stimulus, the American automotive industry has come back from the grave, streamlined their business, and cut excess costs. They're now coming back with what will hopefully be stronger strategic plans. Now that the big 3 manufacturers are slowly coming back, many are encouraging Americans to buy back into the auto industry by buying new car. MSN reports that if you have a relatively good credit history, then you can probably receive a pretty low rate on a car loan. Folks with untarnished credit will find good rates, eager lenders and some amazing deals as increasingly desperate car manufacturers try to revive sagging sales. With many lenders eager to work with consumers and a car industry highly motivated to keep sales alive for American-made products, you can get some great savings towards the purchase of a new car. On the other hand, people with low credit scores are having a hard time getting the same kinds of deals as those with stellar credit histories. While these customers can still receives loans to buys cars, the rates are much higher, which puts the customer at risks for not being able to make the monthly payments. Folks with troubled credit will find higher rates, increased scrutiny and warier lenders, but they won't face anything like the trouble they'd experience if they were shopping for a mortgage. Lending standards from the automakers have been made much stricter since the crash as they now know the inherent risks in lending to those with big credit risks, and they didn't want auto lending to become the next sub-prime lending crisis, as it did in housing. In order to stave off this concern lenders are currently more likely to work with consumers who have a positive burrowing history. If you’re concerned about your loan application, check your credit score and consider talking to a lender about finding a better rate, and options for cash rebates or savings. Also consider finding a loan through a credit union or other bank before going to the dealership, and ask the dealership to beat the best rate that you find. Control the things that you can, like improving your credit history. Pay off all installment loans on time, dispute incorrect statements on your credit, ask companies to remove things from your credit file, and pay off debts that you may have. When it comes time to actually purchase your car, also make sure to get and research free insurance quotes online to get the best deal on insurance as well. Don't forget to look up ways to get a reduction in your insurance rate, like multi-car discounts, and companies that give discounts for good drivers. While the automotive industry is back on it's legs, things aren't completely back to where they were before. Lending standards are now stricter, and if you've got a dent in your credit, you may not find it as easy as before to find a deal. The key is to do what you can to improve your credit, shop around for the best deals on cars and insurance, and in the end you'll find what you're looking for. Have you found recently that buying a car was a bit tougher? Tell us about it.